The following articles about the life and art of P. Buckely Moss have been extracted from recent issues of "The Moss Museum Messenger," an offical publication of the P. Buckley Moss Museum. The Museum exhibits and interprets primary examples from the extensive body of water colors, oil paintings, drawings and prints created by the living American artist, P. Buckley Moss (b. 1933). To read an article, please click on the title below. "Rediscover Art" is the Moss Museum's motto. This reflects the Museum's overall goal to present original art in a friendly forum capable of bringing the public's attention back to a true sense of aesthetic joy. The art of P. Buckley Moss is especially suited to this purpose. Peter Rippe, the author of these articles, was the Director of the P. Buckley Moss Museum since it opened in 1989 until 1999. A fellow of the Henry Francis du Pont Winterhtur Museum in Delaware, he has been director of museums in Richmond and Roanoke, Virginia and in Houston, Texas. He is a past president of both Texas' and Virginia's museum association and has served on the governing council of the American Association of Museums. The Virgin Mary, often referred to as the "Madonna" (Italian, my lady), is one of the most common subjects in Christian art. Depicted both with and without the Christ Child, St. Mary appears on the walls of ancient Roman catacombs, as an enthroned queen or protectress in Medieval art, as a sweet/suffering mother or a stunning carefree beauty in Renaissance art, and as a variety of feminine types during all other periods even to our own day. Religious and non-religious, the attributes of the Madonna as shown in Western art are as broad and as mixed as the name "woman" and all of its implications can possibly imply. P. Buckley Moss in her Blue Madonna captures many aspects of this usually saintly and always feminine archetype. Theologically speaking, Moss' Madonna can be best understood as a pictorial image of the ancient dogmatic concept of the Divine Mother. It is related to the many paintings of the Virgin which can be loosely termed as "devotional" rather than Biblical, historical, or social. Consequently, the Blue Madonna is neither a teaching piece nor a portrait piece, but rather a traditional "icon" through which the viewer is asked to transcend his/her physical existence into a new emotionally and spiritually centered world. This can be a somewhat difficult concept for many people who were brought up with the artistic expectations of Renaissance reality, anatomical correctness, and even self-centered abstraction. Moss' world of mystical insights, if one stops to consider, can often be a rather jolting experience. The Blue Madonna exists primarily because the artist wanted to share her own reaction to the woman who is known, theologically, as "The God Bearer." To begin with, this is no real woman of flesh, blood, passion, and desire. In contrast to many other artistic renditions of this basic Christian theme, Moss does not intend her Madonna to remind its viewers of some regal queen, or an old love, or even of one's long suffering mother. 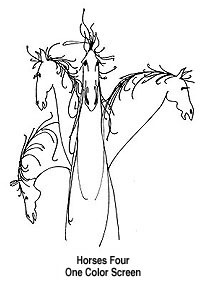 The falling shoulders and the extremely long neck, as well as the gentle tilt of the head, are meant to discourage such associations. This is a new creation that the viewer's eyes are allowed to enter wherein they are expertly directed by the artist's use of lines of composition, contrasting colors, and obvious textural effects finally to the brilliant deep green eyes of the piece itself. It is in the very depths of these unusual eyes, that the viewer's gaze comes to rest, caught in the loving reflection of a holy woman's maternal, ageless, and unconditional concern for all creation. To illustrate the power of the Blue Madonna, quite recently, a little girl about two years old came into the Museum's exhibition with her family and began the gallery tour. The guide, as usual, told the family about Pat Moss' early years and about her) training as an artist. As the guide talked, the little girl moved ahead to the Blue Madonna where she stood on her somewhat wobbly little legs just below the painting and stared innocently upwards into the Madonna's eyes. Finally, the tour moved on past the painting and into the section that shows how Pat Moss developed her distinctive Valley style. Still, despite her mother's admonitions, the little girl kept going back to the Madonna painting where she would stand transfixed ... or pointing and saying "donna, donna," remembering at least the best part of the "pretty lady's" name as learned from the guide. This little girl had caught the spirit of the Blue Madonna and was basking, so to speak, in this icon's inner radiance. The same thing can happen to an adult who is drawn emotionally and intellectually into the spiritual reality of this powerful work and finds there a new wonder of discovery. The Blue Madonna by P. Buckley Moss is one of the pieces most favored by the public in the entire Moss Museum collection. Seeing the image of a goose, whether drawn by P. Buckley Moss or somebody else, can be the beginning of a complex series of thoughts. Contemporary scholars have named this process "the stream of consciousness." Of course, as much depends upon the maturity of the viewer as on the artist who has produced the image. A small child, for example, will see a two legged, long-necked, bird where a scholar of Medieval art might see a divine presence. Interpretations will vary, but behind them all will be those elements of meaning which are common to cultures, religions, as well as intellectual levels of understanding. For the inquisitive viewer, a goose image in a popular work by P. Buckley Moss provides an opportunity to explore the entire history of cultural, religious, and psychological imagery. From its prehistoric beginnings, art has been experienced and practiced primarily as a means of communicating important ideas. Accordingly, in most western art the meaning, or the story, behind what is actually portrayed is often more important both to the artist and to the viewer than the reality of the portrayal. A goose in art is only a goose at its most basic level of existence. Beyond its feathers and its distinctive shape, this bird in the hands of an accomplished artist such as Pat Moss becomes an opening for an entire range of nuances, interpretations, and symbolic references; a beginning for what is rightly called "the artistic experience." Before continuing this dissertation on Moss geese and their possible meanings, a related question must be addressed: does the artist actually intend her viewers to see beyond the reality of her images and, secondly, is she aware of what she is doing? Interestingly, this is the kind of question which doesn't usually concern serious art historians since many of them tend to see artists as mirrors rather than creators of culture. Accordingly, they generally have concluded that when a great artist paints or draws the results are so far beyond the limitations of one human life that even the suggestion of total artistic planning and, for that matter, understanding is ludicrous. The making of art is not an exact science and an artist like Pat Moss must be free to wander, so to speak, into the world of her subconscious where the creative process is unfettered by everyday concerns. Likewise, viewers of her art should also feel free to wander their own subconscious where memory, hope, despair, frustration, happiness, joy, etc., exist as common human denominators. Probably this is why her art is so popular and why she strikes so many common chords in so many different collectors. Pat's geese, like many other symbols which she uses (including the Plain People, children, horses, trees, etc.) are like doors provided by the artist through which viewers can pass into new worlds of understanding and insight, perhaps even beyond the conscious understanding and the intended insights of the artist. Returning to the imagery of the Moss goose, let us explore some of the "feelings" engendered by this animal. Imagine settling one's head into the elegant softness of a goose down pillow. Or, remember again the feeling of warmth and security which came with being swallowed up in a goose feather bed. Annual catalogs remind us that goose down comforters and down filled winter coats are still the standard against which the various "imitation" fillers are measured. In these illustrations, the goose becomes synonymous with softness, comfort, warmth, security ... all downright sensual images which are possible and legitimate meanings for this important Moss image. But like any good pictorial image (icon), the goose's iconography is usually much more than just sensual. Other possible meanings could be related to the sounds that geese make which are impressed on the human memory. For example, the contented and rhythmic low honks of a family of feeding geese are soft, regular, friendly, and reassuring. Then think of the noises made by an alarmed goose, especially one protecting a family of its goslings. Its honks and hisses have the potential of rising to the heights of avian warfare. Finally, think of the distantly haunting sounds, usually only faintly heard, of a flock of wild geese on the wing following their leader in a pattern across the evening sky. These sounds have produced banks of visual images which are common to most of us, sources of inspiration from which Pat Moss has drawn many times. Though sounds do influence how we think about certain subjects in the visual arts (especially geese), usually shapes and colors area greater concern. Pat Moss loves to draw geese! She finds them artistically interesting combinations of swerving curves, contrasting masses, elongated shapes, and restful colors of brown to gold and gray to silver. Using their lines and outlines she is able to express a whole vocabulary of moods, from rigid dignity through humorist contradictions to streamlined grace. For Pat, the "expressions" of well-drawn geese are the dignity, the determination, the sincerity, and even the contented happiness of many of her most important works. However, beyond the presence of its remarkably expressive shape, the goose has inherited an age-old accumulation of literary, cultural, and religious identities. Many artists have been influenced by the goose image found in traditional stories and songs beginning with "Mother Goose" of nursery rhyme fame, through the fabled "goose that laid the golden egg," to the "silly goose," simpleton, image of old folk tales. But these are not Moss geese, either because they're too child oriented or too derogatory. Over and over again, Pat either has focused on universal cultural images for her geese or on their religious significance. To her way of thinking, the goose is too noble an animal to be the brunt of a joke or the subject of a fable. Usually, Pat's geese are very serious with meanings that transcend the mundane and the commonplace. In this way a Moss goose is like its cousin, the swan, whose awkward and ugly you this forgotten in its splendid maturity. It is, finally, as a religious or ethical icon that the goose is most important to the art of P. Buckley Moss. The legend of the Capitoline geese who saved Rome from invasion of the Gauls is well-known and accounts for its role in art as a symbol of vigilance. Later, in Christian iconography geese became artistic and theological symbols for providence (Divine), and loyalty (usually matrimonial). Western Europeans considered the goose, or more correctly flocks of wild geese, as messengers and gifts from God who in their migratory flights foretold seasons and predicted the weather. At the same time, they provided a source of rich and some say greasy meat to what was otherwise a limited diet, as well as feathers and down for warmth and comfort. Finally, vigilance and providence were joined by loyalty when people noticed that geese mated for life and that both sexes of the specie assisted in nest building, the incubation of eggs, and in the feeding and raising of young birds. With her geese, Moss draws on the accumulation of over two thousand years of symbolic evolution. An interesting theological sidelight on the goose is the ever popular story of its feet. Considering the almost divine reputation of the Medieval goose, it's not surprising that some theologians began to worry about its "goodness." It is then that its feet, along with numerous other birds' feet, became symbols in themselves of a sort of curse or sin. What with scales, webs, claws, and the fact that feet obviously mixed with the dirt of the earth, geese feet were seen as evidence of a character flaw which was immediately associated with the devil, who, as everyone knew, had similar appendages. Possibly this is where Pat Moss inherited her prejudice to geese feet and why, either consciously or subconsciously, except in rare instances, she never shows their feet, cursed or otherwise! Despite this "flaw," the goose has been unofficially "canonized" by the church as the official symbol in art of St. Martin of Tours. Here the anti-feet theologians have allowed the goose the honor of "speaking with the authority of God" since it was by its prophetic honks that the people of Tours were led to the place where their modest saint was hiding. These people, it seems, had selected Martin as their bishop and the noisy goose made it impossible for him to refuse their honor. St. Martin became a great crusading bishop who extended Christian orthodoxy across most of Western Europe by suppressing heretical sects. As the hero of the day, the goose of St. Martin was often used on the banners, and later on the coats-of-arms, of enthusiastic Christian knights who remembered that Martin himself had once been a knight and that it took a lowly goose to bring him to his destiny. Like St. Martin's goose of old, the footless geese of P. Buckley Moss tell their own story. This is what is called "iconology" through which we can come to a fuller understanding of Moss' art and, possibly, of ourselves. Pat Moss is in every way a serious artist. This said, one can go on to state that she also has a keen wit and a definite sense of humor which are often expressed in her art. This is not to imply that every painting or print by P. Buckley Moss necessarily has a funny side. There are many times when her work is deadly serious; when, for example, it's treating deeply religious or philosophical subjects. Notwithstanding, even in many of these works Pat will have added some small detail which will bring what could easily become an overly pompous concept back to the reality of everyday life. For instance, the otherwise atmospheric and semi-religious mood of pieces like Tintern Abbey and Wisconsin is "humanized" by the subtle introduction by the artist of a single milk cow, just to the side of the main subject, as a reminder that even the holy and the grandiose is ultimately subject to the common commodities of life. 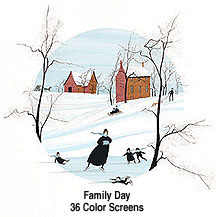 Accordingly, it's exactly Moss' quiet humor that recently appeared once again in a small watercolor entitled Family Portrait which has been reproduced as an offset print (York Graphics, 1991). Regular readers of the Moss Messenger realize that geese are extremely important symbols in the works of P. Buckley Moss (see "The Iconography of the Goose in the Art of P. Buckley Moss). Even so, geese are not exempt from Moss' humor. Family Portrait, is, in fact, a goose's eye view of six other geese; necks extended and beaks pointed all in the same direction. It's as if the viewer of the piece of art has invaded the mind of a goose who is, in turn, trying to figure out what his/her brother/sister geese are so intently observing. Funny?... not ha ha; but certainly humorous and far from the ostentatious world of what some people wrongly think of as "the fine arts". One must only remember that, primarily, art is meant to communicate all sorts of ideas and emotions, and Pat Moss, fortunately, just likes to communicate smiles. Who are the Plain People? Where did they originate and where do they live today? Why do they live as they do? What is the place of the Plain People in the art of P. Buckley Moss? The "who, where, why, and what" of the Plain People are questions often heard at the Moss Museum. Almost everybody who knows the work of Pat Moss knows that the Amish and Mennonite peoples, the "Plain People" as they are commonly called, are among her favorite subjects. Her stylized versions of these people appear in many of Moss' most popular paintings and prints where their elongated bodies dressed in distinctively simple clothing practically have become her trademark. And while many people can identify the Plain People as "those old-fashioned, religious folk with their quaint looks and buggies, who live without electricity and plumbing..," very few people who don't actually live among them have a clear idea as to their real identity and history. Quite recently a nice lady who had just attended her first Moss Convention told me that she had purchased a clock from the "Amish" at a place in Kentucky. She continued to talk about the place with its simple architecture, its handmade furniture, and its curiously dressed inhabitants. Suddenly I became aware that she was not talking about a living Amish community, but about an historical Shaker museum restoration called Pleasant Hill. After all, she must have thought, Pat Moss' Plain People with their strange dress and their seemingly foreign beliefs must be one and the same with the now almost extinct Shakers. She had simply confused one communal group with another, the aesthetic English/American Shakers with the Germanic and Swiss Anabaptists; the Amish, and the Mennonites. Unfortunately, this seemingly harmless mistake robbed its misinformed enthusiast from ever hearing and knowing the completely different messages which these two unlike religious groups have held out to the world. Shakerism, based on celibacy, a female redeemer, and a lifestyle that stressed eternal virtues which were reflected in divinely ordained styles and designs is considerably removed from the Anabaptist philosophy of strict Christian morality, ethical community behavior, extreme group loyalties, adult baptism, and a distinctive lifestyle marked by an obvious separation from the world. In her art, Pat Moss uses highly personalized representations of the Amish and the Mennonites primarily for their archetypal value. These images are not meant to be accurate depictions either of a people, a lifestyle, or a style of dress. Moss is interested in the Plain people because of what they represent. For her, the Amish and the Mennonites are living saints, similar to her Catholic saints of old, whose lives had the power to inspire and to regenerate others. They became for her symbols with a strong iconographic meaning. They were a very special people whose lifestyle and appearance had evolved over centuries due, at least in part, to their survival despite almost universal persecution, their faith in God, their belief in a unique Christian community, and their insistence on a distinctively different style of dress and life. Historically, both the Amish and the Mennonites are part of a religious tradition that goes back to what is called the "Radical Reformation" of the mid-16th century. Originally called Anabaptists by their enemies, because they chose to re-baptize previously baptized Christians, these people sought to recapture the life of the earliest Christian communities. They especially emulated their religious ancestors' disassociation from the State and, most emphatically, from the State's religion. While this action placed them at odds with their Roman Catholic and Lutheran neighbors, they also alienated other Reformation Protestants by encouraging what were called "works" of mercy and charity, by baptizing only "consenting" and "understanding" adults, and by preaching theological tolerance and religious freedom. Martin Luther accused the Anabaptists of "works justification" (working for their salvation rather than believing in it) and baptismal sacrilege, while Zwingli and later Calvin found their ideas of religious tolerance and freedom to be odious. Sooner or later just about everybody, except possibly the Reformed Church in Holland (which didn't welcome them, but was willing to try forced conversions) persecuted the Anabaptists, killed their leaders, drove them out of their homes (usually into areas controlled by the Reformed churches), and seized their properties. If the blood of martyrs ever fed a religious movement, Anabaptism was such a movement. In the late seventeenth century groups of Anabaptists, by then called Mennonites after an early leader named Menno Simons, were invited to settle in the American English colony of Pennsylvania by its tolerant Quaker Proprietor, William Penn. These first Mennonites from Holland came as farmers into areas where their descendants remain to this day. Meanwhile, back in Europe, those Anabaptist/Mennonite groups who had escaped annihilation were beginning to settle down to a more peaceful and accommodating life. One such group in Switzerland broke with its Mennonite leadership over the very issue of accommodation with the world. They wished to follow "the old ways." These people were the ancestors of the Amish who immigrated, like their predecessors, to the Pennsylvania frontier (especially Lancaster County). Interestingly, despite the success of these hard-working people in America, today there is not an Anabaptist community left in all of Europe. Even in this country since the 18th century, various groups within both the Amish and the Mennonite communities have evolved in varying degrees into more modern modes of life. Still, there are healthy and growing communities of both Old Order Amish and Old Order Mennonites in many areas of North America. P. Buckley Moss first became acquainted with the Amish and the Mennonites when she moved to Waynesboro, Virginia. Both groups had communities near her new Shenandoah Valley home and their buggies were common sights on nearby roads. Soon she began to meet these Plain People at local auctions. There she had an opportunity to talk to them and to observe their ways. As she wrote in her autobiography: "that afternoon [at an auction] I sat with a group of Mennonites and so started an association that has lasted for nearly twenty-five years and that has had a profound effect on my life and philosophy." Over the years, the presence of the Plain People in Moss' art has become one of the principle means which she uses to communicate some of her most important ideas. These people, for Moss, represent the good life, the full life, and the life well-lived in harmony with nature and in peace with all creation. Through her art and her genius, she has developed a way to depict a very serious religious movement in a universally appealing and friendly manner. In Moss' works the Plain People are seen to celebrate their own existence in such simple delights as skating, sledding, picking apples, riding horses, etc. For Pat Moss, these people and their old ways are memorable icons of strength and beauty. Moss has become a messenger and her art is the message. Her Plain People are one of the many, though one of the most important, subtle instruments of that message. The first thing that many of her collectors declare is that the art of P. Buckley Moss is not like most contemporary art. Pat Moss' quest is to create a "friendly and rhythmic dance" in her art that can be enjoyed without having to have any specialized arts education. Her art is not erudite. She doesn't ask her viewers to exchange any of their own feelings or emotions for her own preconceived ideas. Moss emphasizes the positive aspects of things that only rare individuals seem to see, bringing joy and happiness into focus in a world accustomed to artistic cynicism. Popular printed examples of Moss' optimism can be seen and appreciated in such recent (1996) watercolors as Dancing Joy and Me, Too. These uncomplicated pieces successfully employ the basic artistic elements of line, color, and subject matter to create an upbeat mood that can bring a smile to the face of almost any viewer. In Dancing Joyit's the oval formed by the girls' arms as they spin around inside their flat plain that instantly command one's attention. These girls, like the bird in Me, Too, are highly stylized symbols of reality. Yet the initial recognition of their exuberance captures the imagination of even the most uninformed viewer. They radiate a spirit that immediately convinces viewers of their affirmative and happy message. Moss' rich symbolism is rooted in the traditions and piety of Western/Christian society and in her own warm feelings for life. Unlike most of her artistic contemporaries, she is faced with neither the problem of "the void" (nothingness) nor the death of traditional values. Pat is an optimist by disposition and a spiritual person by conviction, and neither voids nor permanent losses seem to be in her vocabulary. Some critics have said that the popular Moss never quite crosses the threshold into the hidden psyche of art, the unconscious. Frankly, Pat usually doesn't worry about "mysterious agendas". In her defense, it can be mentioned that the great pioneer of modern psychoanalysis Carl Jung wrote that such a present world emphasis "is exactly the 'right' relation to the unconscious." Pat Moss essentially wants to keep her art "readable" and thoroughly understandable, albeit that her style is very individual. The "operative" words for many people are "pretty" ("it goes with my decor") and "cute" ("I see myself or my children in its images"), but these are only elemental concepts. Beyond its immediate appeal, Moss art deals with serious relationships: to society, to the future and the past, and to the conscious and subconscious emotions of love, faith, and fulfillment. Finally, it should be said that P. Buckley Moss is an artist who pleases herself and her collectors with her outpouring of aesthetic joy. She obviously loves what she does and people seem to love her all the more for doing it. DROLLERY \drol-e-re\ pl -eries (Webster's New Collegiate Dictionary). Fanciful designs of a playful character... historically used in the margins of medieval manuscripts: whimsical humor. Also French spelling: "DROLERIES" (Handbook of Art History, key to Janson). People frequently notice and are curious about the crisply drawn, stylized, images of black cats included by Pat Moss in many of her recent paintings and prints. Usually, these images are so imaginatively integrated into a work that they don't disturb either its aesthetic rhythm or its color impact. They're apparently meant to be subtle presences rather than primary subjects. So subtle, in fact, that to many casual viewers their visual existence becomes apparent only upon close examination. Cats in the history of art are ambivalent, usually female, animals who at different times have symbolized both good and evil. Ancient Egyptians associated cats with the protection of homes, mothers, and children. Painted and carved cats along with their mummified remains have been found in numerous tombs. During the Middle Ages, cats were taken as signs of the devil and his evil ways and were believed to be witches' animals. Luckily for the species, its reputation was redeemed when it was noticed that in towns or homes with cats residents were less likely to suffer the consequences of the Black Death, a disease carried by flea-infested rats. Religious art of the time, with its many cat-like drolleries, likely reflects the notion that the presence of cats - rat-killers - was a good omen. In the art of P. Buckley Moss, these black cats are intended to be positive manifestations. Perhaps their presence was inspired by the Medieval cat images that Pat saw cavorting through and along the margins of old manuscripts that she may have studied at the Cooper Union. It was through such manuscripts that she became familiar with Romanesque calligraphy (fancy writing), Scholastic ideas, and vivid religious illuminations (pictures). Perhaps Moss was familiar with the early Christian legend about the "cat of the Madonna". It tells the story of a mother cat who gave birth to kittens in the same stable at the same time as Christ was born. In this popular tale, a feline symbol is used to represent a presence observing a memorable event. Naturally, there's always the possibility that cats in Moss paintings simply mean that there were lots of cats around when Pat was painting, especially in a household with six growing children. This scenario is suggested as a comfort to those who are hesitant to look for meaning in art beyond whatever is obvious. A cat, after all, can be just a cat. But if one looks carefully and thoughtfully, Moss' curious black-cat-drolleries can hardly be considered to represent flesh and blood animals. They're just too stylized. Notice how their eyes are always staring out of the plain of the picture, looking at the looker. These are not portraits based on living cat models, either past or present. They're drolleries: "...fanciful ...playful ...whimsical humorous.." - symbols of a presence. Butwhose? A reasonable conclusion is that these highly stylized animals represent the spirit of the artist herself. Perhaps it's of Moss' way of not intruding into her art, but still being therefor time immemorial... to observe, to enjoy, and to be a part ofthe action that she created? I believe that her spirit is the drollery - cat-like - presence. It's Pat Moss watching those who are watching the art of P. Buckley Moss! Known worldwide as the "People's Artist", P. Buckley Moss has an almost uncanny ability to communicate a sense of optimism through her art. Positive thinking seems to be the key to Moss' entire philosophy, a fact that comes out through her art as well as through her life. Considering her own struggle with dyslexia, it is not surprising that Moss has become the unofficial spokesperson for people affected by learning disabilities. In her role as an artist, Moss has been able to say "yes" to many people who had previously thought that "no" or "hopeless" were the only messages of art - and perhaps the only messages of life - in the late 20th century. These were often people who didn't understand why contemporary art wasn't speaking to them and to their situation. They felt disenfranchised... separated... and confused by the whole art scene. Then along comes Pat Moss with an art that tells the stories of good people leading inspiring lives who are protected by a beneficent creator. Though it's a message that some of her detractors have called overly simplistic, out-of-touch, and sugary, she has remained untroubled in her continuing effort to communicate hope, love, and happiness. Using "plain symbols" of encouragement, Moss has been joined over the years by what is, literally, an army of admirers who see this talented and extraordinary person as an artistic heroine fighting and winning against an art world that often appears to be choking on its own negative "relevance". While Moss' art might indeed be uncomplicated according to today's confusing artistic standards, her position comes out of a thorough familiarity of traditional art history. She knows all about the power of symbols and the effects of media and she understands how artists have always communicated emotional stimuli through the power of their art. Some of Moss' most constant themes, in reality, have become so rich and so profound that their meanings touch on the mystical, where they often take on double and even triple meanings. What one first sees in atypical Moss painting is not necessarily its primary message; possibly it's only a beginning, a mere "surface reality". Examples of these surface realities are the happy Amish people, the attractive children, the beautiful geese, the undulating trees, and the splendid snow scenes. Accordingly, just below or beyond these immediately recognizable images are a host of incredibly rich meanings waiting to be found and appreciated. Here, within a field of critical studies called "iconography" - the pithy substance behind common symbols - is where Moss particularly utilizes her knowledge of artistic tradition, orthodox theology, and cultural awareness. Using the age-old meanings of established symbols, she brilliantly binds together and communicates through art some of her most profound affirmations of life. Moss' reputation rests on her success, first as an artist and, secondly, as a teacher. As a successful artist she has been able to become a great philanthropist who supports many worthwhile causes, especially those that are dedicated to helping learning disabled children. In addition, the same positive philosophy that made her a great artist also makes her a unique teacher and an outstanding role model. Working in a classroom rather than a studio, she constantly extols young people to persevere in their dreams, to set goals, and, as she says, achieve their own success" a little bit at a time." She tells her students that they can achieve... "if it's right for [them and their] abilities." She inspires in art and she inspires in life, and people understand!" I am a strong believer in the power of positive thought..." she wrote in her autobiography. "If I had not developed this attitude early in my life, I would never have overcome the disadvantages of my complicated childhood... If my childhood had been easy and I had learned to read and if I had a secure home, I would probably be a very different person today. I think I might have been a doctor and have had no time for art. It is inherent in me to be always encouraging people to take the positive approach..."
Peace, silence, and beauty are hallmarks of the Moss style. From this it would seem that the quiet themes of still life painting - bouquets of flowers, bowls of fruit, arrangements of bottles and glasses - would be one of Moss' most popular subjects. Yet, to date relatively few still life paintings are represented in the published body of her work. Notwithstanding, astute collectors and critics consider Pat Moss' relatively few still life paintings to be among her finest pieces. While such pieces are not as popular as some others, it can be said that these meditative works capture the purest spirit of this soul-centered artist: her acute sense of unabridged harmony. Since her early student years at New York's Cooper Union, Pat has come back repeatedly to still life themes. Flowers arranged in shapely vases, sparse groupings of luscious fruits, and orderly assortments of bottles and glasses appear as landmark, original, works in her long career. Still life paintings rarely are high excitement pieces. This probably is why so few originals have been selected to be reproduced as offsets. They lack mass appeal. So these works tend to stay close to home, decorating the artist's own homes and the collections of some of her most longstanding admirers. As has been written elsewhere in this series, Pat Moss' most serious and academic works typically are oil on canvas paintings. Still life works are no exception. Two impressive still life oils can be seen at the Moss Museum: Flowers on Red and Red Flowers (above). The former is the premier example of all Pat's oil paintings in the museum's principal collection, while the latter, a somewhat less academic piece that has been reproduced, is displayed prominently in the museum's upstairs' oil painting gallery. It is the singular artistry of Moss' still life paintings, be they oil or watercolor, that endows works of this theme with their particular aesthetic appeal. The typical Pat Moss still life is a coordinated and controlled symphony of line and color. Unlike an illustrator, Pat doesn't attempt to copy Mother Nature's achievements in two dimension. Instead, she uses her distinctive curving lines and flowing forms to literally capture and contain subtle segments of color. From these free-floating islands of tone and hue she creates her own expressions of flower-forms, fruit-forms, or bottle-shapes. These she organizes into complimentary, thematic, arrangements. In this art, Pat Moss comes closest to being a pure abstractionist, though she never quite crosses the line into non-objectivity. Friendly realism is what people expect from a Moss painting, and still-life is no exception. While an original P. Buckley Moss still life is always something to be treasured, a few of these paintings HAVE been very successfully reproduced. One of these, Kaleidoscope (above), is a favorite, rare, offset among print collectors. Kaleidoscope, as its name implies, is an explosion of contained colors set against a non-objective, linear, background. For those collectors whose aesthetic sense is well-developed, the still life art of P. Buckley Moss provides an opportunity to enter a world of unadulterated artistic pleasure. A Moss still life is like a fine piece of classical music: a presentation without words or images to confuse one's sense of inner enjoyment. It's a chance to be truly emersed in the purest music of art. Some collectors look at remarques as possibly "gilding the lily". Others, more frequently, consider them to be one-of-a-kind re-expressions of artistic genius. Both sides have their valid points. But first, what is a remarque? According to experts it is any print, original or reproduction, that contains a mark of any kind (drawn, scribbled, etched or sketched) either on its image surface or on its margin that is not common to the whole edition of the same print. Contrary to popular opinion, a remarqued print does not have to contain any additional pictorial information or be added in an original medium. Simply, it is a print which in some way or another has been marked and thereby singled out, usually, but not necessarily, by its original artist [historically, editors have sometimes remarqued prints]. Pat Moss likes to do remarques, though usually she restricts her remarking to charitable causes. In the process she feels that she is able to "revisit" one of her former creations and add something to its pictorial story and, perhaps to its meaning. Pat's remarques truly are individual creations. A remarque is Pat's second chance to make another statement about a familiar subject. It also gives her an opportunity to "finish" a piece again when the original watercolor or oil painting is no longer available to her. Under these circumstances, the creative process is continued, perhaps even beyond its original concept, to new conclusions. An especially ambitious remarque can becomea new work of art: a reproduction print that has evolved into a mixed media piece. However, this is unusual. Most remarques remain remarques, marked prints with fresh outlooks and revitalized messages. Great art is distinguishable from mediocre art in that its artist is recognizable as an individual whose work can be easily set apart from any school, movement, or influence. Probably this is one of the most significant conclusions that the learned 20th century American art historian and critic, Dr. Edgar P. Richardson, came to when he published his pivotal study of all periods of American art, "Painting in America". Dr. Richardson was convinced that greatness in art is not so much a matter of skill and technique, or even talent, as it is the ability of an artist to express his/her's unique self in the available artistic mediums and methods. This personal point-of-view, according to Dr. Richardson, is the single essential quality that must be present in any art which one expects to have lasting value and meaning. Anything less, according to Richardson, is mere decoration at best or, at worst, mean, dull, insipid and probably misunderstood replication. Art collectors and even casual art buyers would do well to keep this wise dictum in mind. P. Buckley Moss' art is an expression of the artist's unique self. For many people, Moss' art is the most recognizable artistic productions available on today's massive art market. It seems that once a person has been introduced to the Moss style, that person "knows" the art even if they've never met the artist. Her art broadcasts a mood that is unmistakably "Moss". Her subjects, her lines, her colors, and even her deletions (what isn't there - blank spaces and missing elements that are left to the viewer's imagination) are all important parts of her expression of self. Even if her art was never signed, most people still would be able to assign her art to her hand. Pat Moss was trained at New York's famous Cooper Union where she was influenced by the latest contemporary art as well as by great historic art. Nevertheless, she tenaciously maintained her own artistic integrity. Tradition and example for this young artist were guides, not a masters ©©a situation that caused her problems with some of her more rigid teachers. From the beginning her art embodied the heritage of her Italian/Catholic past, the vitality of her exuberant personality, the understanding of a person who had been heckled on account of her dyslexia, and the drive of a talented artist with an overwhelming desire to succeed. Moss is the kind of person whose identity is so rooted in who she is that outside influences usually cannot sway her from her course, as an artist and as a person. Today, Pat Moss has many admirers who collect her art and love "the Moss style." They see her as a unique individual who is able to "speak" to them in the arts in a way that they both understand and appreciate. She has become one of America's most popular artists. Unfortunately, her popularity has led to imitation, and not always by unethical and illegal fakers. Many well-intentioned people obviously believe the old adage about imitation being a form of flattery. While this might be true in dress or hairstyles, it's not valid in the fine arts. Moss admirers who take (cut out, trace, put together) elements of the Moss style and apply them in ways that the artist never intended are guilty of plagiarism. The stealing of artistic ideas without giving legal credit, no matter how well-intended or innocently performed, is still a wrongful attack on this artist's precious selfhood. Sometimes its overenthusiastic collectors and their framers who violate Pat's artistic sense of self. Those "cute little details" that are sometimes used "to enhance" a Moss print can be menacing infringements on the meaning of the original art. Serious art should be properly presented, but people, framers and their customers, have a duty to recognize the limitations of their own creativity. Frames and matting are there to enhance the presentation of a piece of art and to protect that art from destructive elements in its environment. They should neither bethought of as additions to the art nor continuations of the artistic message. A much more insidious enemy of Moss' creative self expressions, however, is what has become a growing throng of outright, second-rate, artistic imitators. Blatant copying and otherwise misusing Moss' imagery and her pictorial techniques is a crime, both in a legal sense and in an aesthetic sense. Of course, in time the obvious forgers will be caught and prosecuted. This is necessary not only to protect the artist but also to protect the investments of her collectors. In the United States an artist holds the copyright on his/her creations as intellectual property: an outright forgery is a blatant theft of that property. But in a broader sense, intellectual property is a difficult kind of property to defend. Artistic plagiarism by less creative artist/illustrators is relatively common. Perhaps it's worth reminding the "collectors" of such second rate art, even if the so-called "artists" themselves don't realize it, that if the personal point-of-view is at the heart of great art then a borrowed ("stolen") point-of-view is at the heart of mediocrity. Pat has often been asked "how long it takes her to finish a new painting?" Her answer invariably is that "it took me about fifty plus years to do this work!" Her point is that every painting is the result of a life-time of experience, training, experimentation, joy, failure, and success. P. Buckley Moss' art is the sum of her unique self... without any frosting, reinterpretation, or imitation. Moss' personal point-of-view is the single most important characteristic of her art. As Dr. Richardson observed, all value and meaning flows from this expression of self. Truly then, what is uniquely Moss can only be "uniquely Moss." Offset reproduction refers to a photomechanical process of reproducing an original image by first "breaking down" or "separating" the artist's blend of colors into four constituent colors and then recombining them on a printing press to approximate the original work of art. 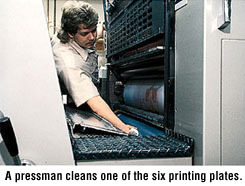 This process, which takes approximately three weeks from start to finish, results in prints that are exactly the same throughout the press run. By using the highest quality acid-free rag paper and a faithful interpretation of the color and tone of Pat's original work, her print editions can honestly portray her message to Moss collectors even though she is not directly involved in the printing process. Because Pat limits the edition size of her prints, usually to 1,000 and 25 artist's proofs, they are known as limited edition offset reproductions and are highly collectible. The following process describes how Pat's original art becomes a print edition. 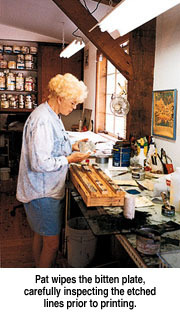 After Pat has completed an original watercolor painting in her studio, she allows her creation to be reproduced so many people will be able to enjoy her art since the demand for her art greatly exceeds her supply of originals. This reproduction process begins at The Moss Portfolio, where the image size, paper size, cost and edition size of the print are determined. Once the preliminary production work is completed, the original watercolor is shipped to the printer where the print edition will be made. The first step in the printing process involves photographing the original with a special camera that separates the art colors into four printing colors. Using a color filter in front of the lens to absorb unwanted colors and transmit the wanted color, one continuous-tone negative is produced for each of the four colors used in printing. These colors are yellow, magenta (red), cyan (blue) and black. If the reproduction will be a different size from the original painting, cropping or reducing is done at this time. Tonal values in each color negative are carefully compared to the original. Once this examination is complete, the image is projected through a camera lens and through a grid pattern to produce a screened positive of the image with a dot pattern. Fine dots in the pattern will print as light areas, while large dots make dark areas. As the dots blend together entirely, solid color areas appear. A halftone negative is made of each of the four colors, and again they are compared meticulously to the original. The four color negatives are printed together to create color proofs that estimate how the finished print will look. These rough proofs are examined and fine adjustments are made to refine the image. Final proofs are approved by Pat or her representative. After any corrections are made, the film is "stripped" to another piece of clear film which is placed against a thin, light-sensitive aluminum plate. A powerful light source transfers the dot pattern for that color to the plate and developing solution makes the pattern visible. Once a separate plate has been made for each of the four colors it is time to go to press. Offset lithography is based on the principle that oil and water do not mix. Each plate is mounted on a cylinder of the printing press. This cylinder is then exposed to a water roller. 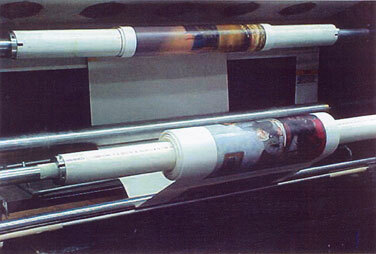 The water from this roller will not adhere to the grease-based printing image and will repel the ink from the non-image area. Next, from an ink roller, particles of ink adhere to each printing dot on the image plate. The inked area is then transferred to the offset blanket. This rubber blanket is used to transfer the ink onto the acid-free paper because it transfers the image more smoothly than the metal plate. Because the ink image does not go directly from the plate to the paper, it is considered offset printing. All of Pat's offset reproductions are printed on the highest quality acid-free paper. The color-fast, fade resistant inks used are specially formulated to meet the standards of the Fine Art Trade Guild of Great Britain and cost about five times more than conventional inks. By using the highest quality materials and recommending conservation framing for archival permanence, Pat ensures that future generations can also enjoy her artwork. 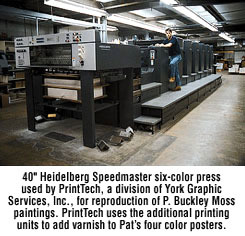 Even though the printing process does not occur in Pat's presence, she works closely with The Moss Portfolio staff and York Graphic Services, Inc., to insure that the reproduction genuinely represents her original artwork. Final approval of all print editions comes from Pat. The signature that appears on the prints warrants that each print is reproduced from a P. Buckley Moss original and meets her expectation of quality. 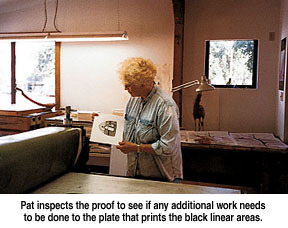 Each etching in an edition is an original print because it is pulled directly from the plate on which Pat has created the image and comes in no other form. In this respect, etchings differ from offset reproductions for which the original image is created in a different medium such as watercolor or oil painting. Because, in the case of the offset, the image starts in one form and ends in another, it is termed a "reproduction." 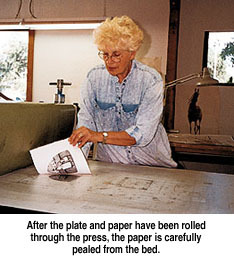 Pat's involvement in the creation of etchings has been described as a "labor of love." Each etching requires an enormous amount of time and energy, and she is able to produce only a limited number of editions each year. Pat uses many of the same techniques employed by the sixteenth and seventeenth century masters, such as Rembrandt and Goya. First, she selects a metal plate, usually steel but on occasion copper, which is cut for her to the size of the image she intends to print. The plate is then thoroughly cleaned and polished so its surface is smooth and without blemishes. Next, it is coated with an acid resistant substance to create what is called the "ground." Using a fine-pointed steel needle, Pat draws the outline of her image onto the plate. The needle scribes through the ground to lay bare the steel beneath. When she has completed her initial drawing, the plate is placed in a bath of acid. The ground protects the plate from the acid; but, where the needle has drawn, the acid eats into the metal, creating an etched line which subsequently carries the printer's ink. The plate may be immersed into the acid a number of times during this process. When it is first removed, those lines which Pat wishes to be the finest lines will be covered with a new application of the ground. When the plate next goes into the acid bath, these areas will be protected from further "biting." 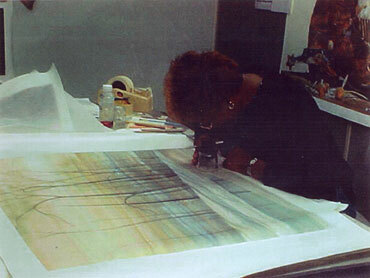 Following this method, she is able to vary the depth and thickness of the lines throughout the plate. When all the lines are bitten to the correct depth, Pat wipes the ground off the complete surface of the plate, polishing its surface to make certain that it is totally clean. Next, she applies the ink, pushing it into the bitten lines. When satisfied that all the lines are filled with the ink, she again polishes the plate's surface so that no ink exists outside of her drawn image. The procedures described so far relate to the linear areas of the image. We now need to address how the multiple colors and tonal effects are achieved. For these she uses a second plate, cut to the exact size of the first. To this plate she applies what is called aquatint. She covers the area of the plate where she wishes to apply color with a powdered rosin. She then heats the plate so that the rosin crystals adhere to its surface. Now, when she puts the plate into the acid, the acid eats between the rosin crystals, creating a mass of small inundations which are called "bitten areas." These will subsequently hold the inks. The depth of these areas and, therefore, the amount of ink they will hold will, again, depend on the time they are exposed to the acid and will also determine the tone of color and the texture of the print. Where necessary, she is able to reduce the intensity of tone and texture by burnishing the bitten surface. When Pat has prepared both plates to her satisfaction, she applies the inks. On the aquatint plate, she applies the different colors, bleeding and blending them together to achieve gradation of color. It is now time to print the first proofs of the image. 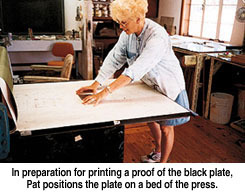 Pat begins by laying the aquatint plate on the bed of the printing press and placing over it a sheet of dampened cotton paper. The plate and paper pass through the cylinders of the press, forcing the moist paper down into the etched areas which hold the ink. The ink is thereby transferred onto the paper so that when the paper is removed from the plate, it carries the areas of color and texture. Now, Pat replaces the aquatint plate with the plate containing her drawn lines, placing it in exactly the same position on the press bed. When the plate and paper pass through the press, the etched black lines become superimposed on the areas of color. For each individual print, both plates have to be re-inked before printing. Again, this is done by hand and, inevitably, no two prints turn out exactly the same. This further adds to the original character of each etching print. This describes what is involved in Pat's creation of each etching. There are additional techniques and variations that she also uses in certain circumstances; but, if you understand the above, you know the essentials of her technique. One final note: etching editions are kept small because the etched surfaces of the plates deteriorate after a certain number of printings due to the immensepressure needed in printing. Copper, being a softer metal than steel, is less durable, which is why Pat usually works on steel. For the making of a silkscreen, Pat uses water-based inks which are non-toxic. She starts by painting single-color brush strokes onto a piece of mylar which is then placed on a screen which has been coated with a liquid emulsion. The emulsion is then exposed to light which causes it to harden except where Pat's brush strokes protect the screen from the effects of the light. When the mylar is removed, the screen is washed. The areas of the hardened emulsion remain intact; but, where the brush strokes were placed, the emulsion dissolves, leaving open the mesh of the screen. The screen is placed over the print paper and the ink, which has been mixed to the chosen color, is forced through the open mesh of the screen, creating on the paper the image of the brush strokes. This process is repeated time and again for each of the areas of different color Pat uses in creating the image. With each application of the ink, decisions are made as to color, bearing in mind the effects of placing a color on top of another that already exists on the print. Some of Pat's silkscreens involve over one hundred separate applications of color. When printing an edition, each of the colors is applied to the whole edition in turn, building color upon color. Giclée (pronounced zhee-clay) is a French word meaning "to spray." 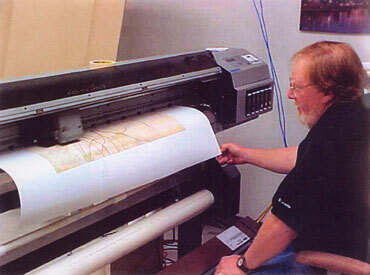 This method of printing is a 20th-century digital process derived from the Iris large-format technology. No other reproduction process can match the quality of a giclée, nor come as close to reproducing the artist's original than the giclée process. Owning a giclée print by Pat Moss is the next best thing to owning the original itself. While the quality is outstanding, the giclée is much more affordable. 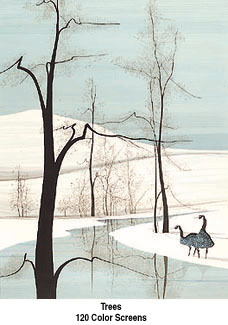 Pat's giclées are printed in small editions of just 250 prints and 25 artist's proofs. Because of their scarcity, they are true collectors' items. To create a giclée, Pat's original painting is photographed under specific lighting conditions. A digital file is created. The master printer then manipulates this file so that the hues and subtleties in color of the original will be captured in the reproduction. This involves many stages of proofing: outputting a print followed by color corrections in every inch of the reproduction. The goal is for the reproduction to match the original. Once the master printer feels he has achieved this goal, a final proof is sent to Pat. She marks up any further corrections that need to be done to the print. Once these final corrections are completed, production is ready to begin. The final file is sent to the printer and the image is printed either to paper or to canvas. The ink is sprayed back and forth across the surface, line by line. This printing process is slow but very precise. Each of Pat's pieces takes from 30 to 60 minutes to print, depending on size, and is closely monitored throughout the process. 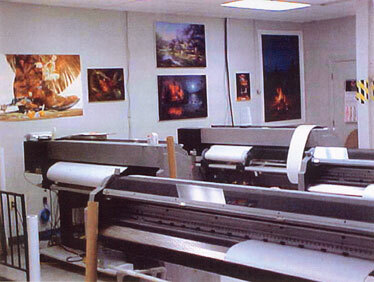 When a giclée is printed on paper, each sheet is fed into the printer individually. After it is printed, the sheet is trimmed to the final size. 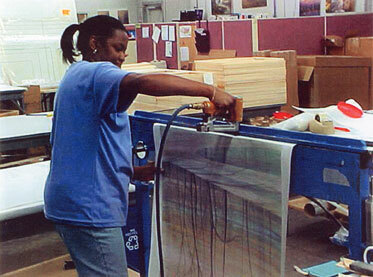 safe, protective coating is applied to each image on the roll of canvas. This protects the canvas from damage, such as water, and retards the natural aging forces in the home environment. The inks used are pigmented and not dyes. Pigmented inks ensure a long-lasting, more fade resistant image. The canvas is archival and of the highest quality. A staff of curators carefully inspects each canvas. Any printing flaw or canvas defect is detected at this stage and the canvas is either repaired or rejected. The final product is then ready to be signed by Pat. After signing, a final inspection of every canvas is once again completed. 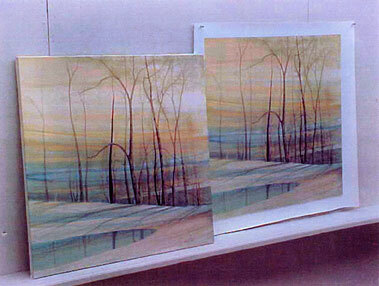 Each canvas is stretched and attached to the wooden stretcher bars according to Pat's specifications. Sizes and corners are exact. Corners are grooved and wedged. An important advantage of the giclée method of art reproduction is that the final product requires no matting or glass cutting. The canvas arrives at the gallery ready to be framed, just like a painting.